When she was young, Annie Ferland spent her days exploring the island she and her family lived on near Quebec City. Formerly a farm tended to by her grandfather, Annie would slip on her rubber boots and walk along the river with her dog in tow. This river was the same one her father played in when he was a child, but it looked much different then. Growing up, Annie recalls the river being filled with litter of all shapes and sizes, from discarded wrappers, to old mattresses, to abandoned car parts. Her father would tell her tales of how he would spend his days fishing along the riverbank, but all Annie could see was the present-day, cloudy river filled with trash. She kept thinking how nice it would be to go fishing without reeling in a boot or an old tire. 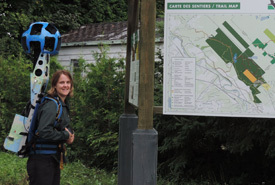 Wondering how she could make an impact on this area helped fuel her desire to do more and help restore and conserve landscapes across Canada. AF: I studied at Cégep de Sainte-Foy in Quebec to become a biology technician, and after graduation I went on to study agricultural science at Laval University because, in addition to ecology and conservation, I’m also interested in sustainable farming practices. 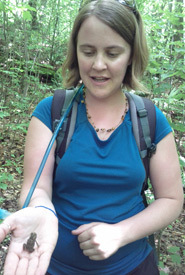 AF: I worked as an intern with the Province of Quebec on a wood turtle conservation project. It involved going out to look for turtles in potential habitats in the field and some GIS [geographic information system] work to identify priority areas for conservation. Very similar to what I am doing now! The internship highlighted the urgency of protecting habitats to conserve wood turtles and other species across Canada. AF: A typical day takes place at the office, since there are a lot of things and people to coordinate. I usually work on three to five different projects at a time. The work involves a lot of fundraising and reporting, as well as communicating and meeting with various partners and landowners. I’m often on the road for off-site meetings, but sometimes I’m in the field doing various stewardship tasks, such as surveys and property monitoring. AF: I would say that there are a lot of best moments. Meeting a species for the first time, such as a rare plant or animal, is always a highlight. RB: Why is it important for women to be in science and the conservation field? AF: I would say it’s important for women to be in science, since it’s important for them to be able to access any profession they want. I think women bring as much to science as men do, but if science is accessible to a greater number of people it will accelerate the speed at which research is done and progress is made. We now live in a great time that allows women to do whatever they want. RB: What advice do you have for women looking to make a career in the science or, more specifically, conservation field? AF: Like any other field, dedication and focus are key. Don’t hesitate to take an entry-level job, as it’s often the best way to learn the basics and progress within an organization. Sometimes science can be very tedious, but don’t forget your curiosity and your creativity as they can be quite useful.